Many incentive programs target our top performers for outstanding work. It’s a solid strategy. The belief is that this top percentage of sales personnel will naturally be more receptive and responsive to the motivational triggers being utilized and thus are more primed to execute within the goal-achievement structure of a typical incentive program. For many companies, however, the top performers only make up about 20% of the total population. 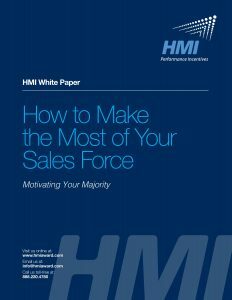 So, how do you engage the other 80% of your sales force, those with the highest potential for growth? Download our whitepaper to find out. Focusing more on your customers and moving mid- to small-sized accounts? Check out our eBook on Moving Your Middle, here. Or, if you’re looking for other sales growth tactics, click here.